An online training consists of several lessons that cover all key functions of BSC Designer Online and its practical application in the business environment. In each step you’ll follow our guidance and will build your scorecard project. 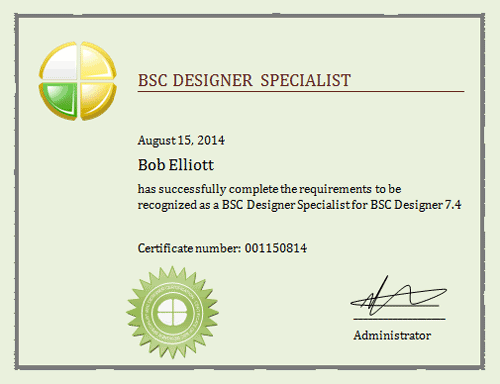 As a result, on the final step you will know all the details about how to work with the major features of BSC Designer Online. 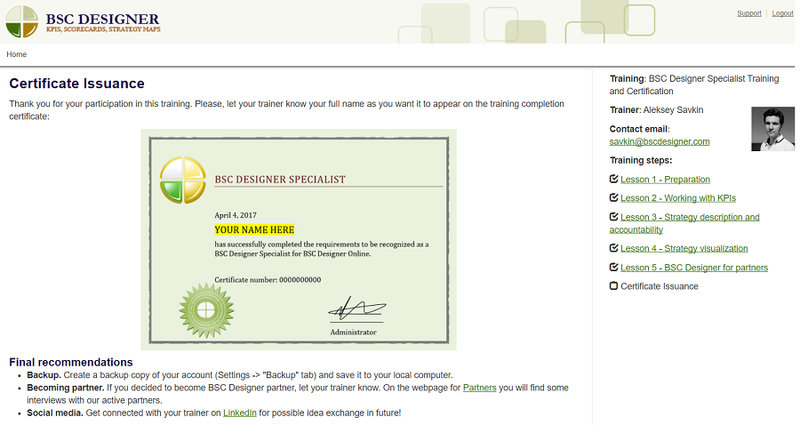 BSC Designer Specialist Training – final step, trainee is ready to get a certificate. The certificate includes the full name of the trainee who successfully passed the training and is delivered as a print-friendly PDF document. The certification is not only a great way to demonstrate your proficiency in business performance management software in your CV, but is also an excellent opportunity to join our partners network. In our partners network we connect together specialists who are certified in BSC Designer and the customer companies that are interested in a local representative. Once payment is processed you will have a link to the training area with the first lesson.